These adorably fun Aliens can be made by themselves or as part of a set that includes an Easter Egg Rocket and an Astronaut. 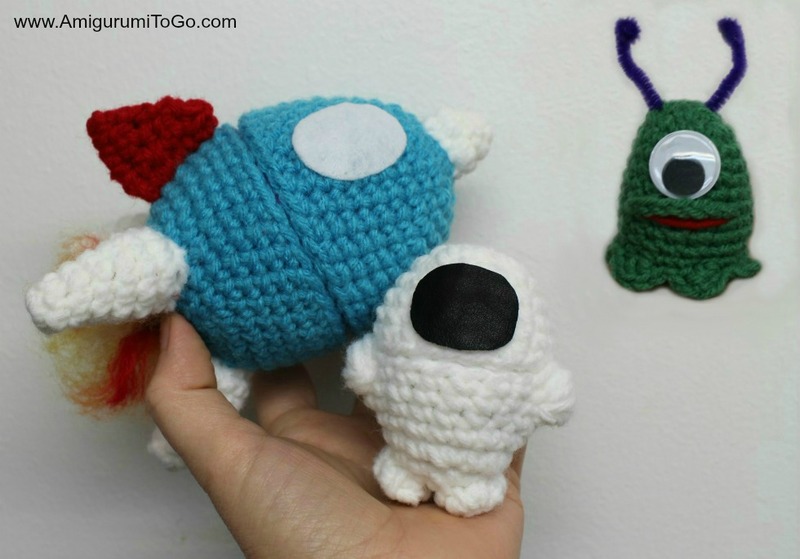 There's 9 more, incredibly fun, Easter Egg amigurumis! Links at the bottom of this page. The print friendly button is at the bottom of this pattern. If that doesn't work for you, please see my FAQ page here where I explain how to save or print the patterns. This is not required but greatly appreciated. at the bottom of this pattern. something for the eye like a piece of felt, crochet or paint, a button. Whatever works as an eye. I used a large googly eye and hot glued it on the face. Each row has a sequence as given below. Example: 1sc then 2sc in next st means repeat that sequence 1sc then 2sc in next st followed by 1sc then 2sc in next st over and over to the end of that particular row. The number inside the parentheses ( ~ ) is the number of stitches you should have at the end of that particular row. 13) ch2 then 2dc in next st, sl st next 2 st, repeat that, ch2 then 2dc in next st then sl st next 2 st. repeat that sequence all the way around. f/o and weave in yarn tail. Using a pipe cleaner, I poked through the inside of the head, cut the ends shorter then rolled the ends into a ball. I didn't do anything to secure the pipe cleaner as it stayed in place fine for me but you can sew it in place. A couple of holding stitches with yarn will work great, knot off on the inside of the head. The mouth was done with a strand of red yarn, doubled and knotted off inside the head. I chained a length of green yarn (ch7) and put that over the red yarn, knotted the yarn tails inside the head. I finished off the face by gluing on one large googly eye. Push the egg or stuffing inside the body and you're done! I hope you enjoyed the pattern. 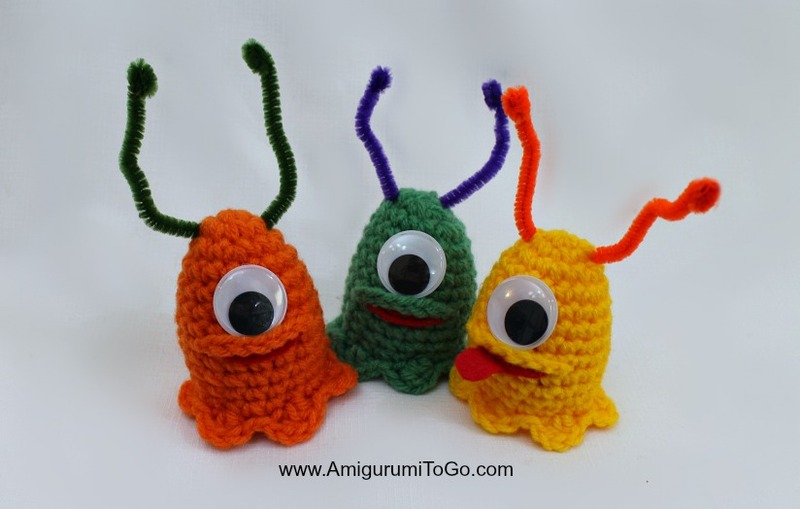 Post pictures on my facebook page Amigurumi Freely. Or post them on instagram with the hashtag Sharon_Ojala. This is not about the slug, but i couldnt' find a video of the Jellybeans. Anyway here it goes. 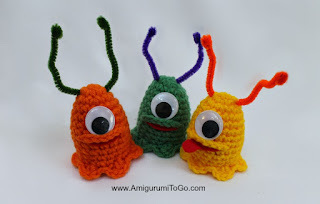 I want the pattern for the Jellybean monsters but i don't have a Kindle. How else can i get it? Thx you for sharing this quick and easy alien slug design. Made a bunch for loot bags for my son's birthday and stuffed them with lollipops.